The Grant Instruments TBT-T100IN Inspissator has been designed in order to create a useful and effective product that is able to produce large batches of uniform tuberculosis culture medium between four and six times each day. The water is held in a tank with a constant temperature of 85degC. The culture medium is incubated on a shallow tray, which is in contact with the water in the tank. This ensures that the temperature is constant. The inspissation takes 50 minutes at 85degC. The Grant Instruments TBT-T100IN Inspissator was designed alongside the Post Graduate Medical School at London University. The product can be found in most tuberculosis laboratories assisted by the World Health Organisation. Robust and durable construction - the tray, tank and robust outer case are made of polished stainless steel. 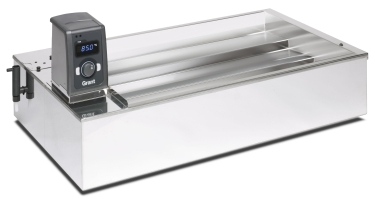 Water temperature under the tray is controlled by a digital immersion thermostat for accuracy and reproducibility of set temperature. All moving parts are incorporated in the control unit which is easily removed for servicing. A constant level device ensures that water level remains constant despite evaporation losses. Batches of tubes are quickly and easily set out and collected from the tray, so ensuring rapid turnover time for batches.